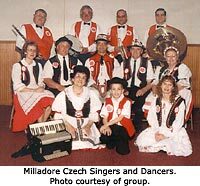 Since 1993, the Milladore Czech Singers and Dancers have been performing traditional Czech songs (in Czech) and dances at schools, festivals, and other venues. The group’s repertoire includes polkas, waltzes, and schottisches, and they like to get the audience participating. They often perform with the Bohemian Musicians. All from central Wisconsin, the group’s sixteen members perform these songs and dances to honor their Czech heritage. Upon request, they can explain the song lyrics and their accompanying traditions, and will bring Czech artifacts. negotiable, depends on the distance from Milladore, time of year, and lengths of performances. Best to contact in evening hours.